I am linking up once again with the fabulous ladies at Collaboration Cuties for their Must Read Mentor Text Linky. This week, the theme is science. 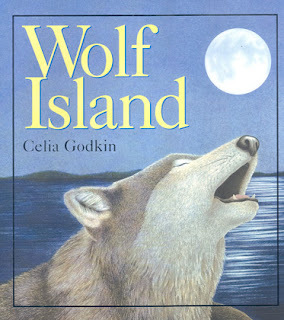 The book I am recommending is Wolf Island by Celia Godkin. Based on an actual event, this book tells what happened to an island in northern Ontario when a family of wolves left the island for the mainland. Life was easy at first and deer flourished and multiplied, eating so much food that rabbits had less to eat and the foxes, which depended on rabbits for food, had even less. When a hard winter came, the animals suffered from the food shortage. Even the deer were hungry and began to nibble at trees, which then died. As the weather grew colder, ice formed a bridge to the mainland and the wolves returned. They ate the weaker deer and brought the population back into balance and enabled other animals to survive. Rarely has the working of an ecosystem been demonstrated in such a straightforward and dramatic way. Young children will be able to understand the story, and older children will find much to think about and discuss. Celia Godkin does not waste a word and her lovely full-colour illustrations make this a memorable book, which should be in every school and public library. I used this book for the first time this past year and my grade 4 students really loved it. I know the story is pretty straight forward but they really understood it and used it as a basis for later discussions and making connections. It was a wonderful way to demonstrate the interdependence of animals and plants in a food chain/web. I did not bring home any of my science files so I have no freebie of my own to go with this book BUT I did find this awesome freebie book guide that has great discussion ideas and activities. Hope everyone had a great weekend. See you tomorrow for Monday Made It! Looks like a great book for you Canadians! :-P hee hee! Thank you for sharing and the link to the freebie! This looks like a cute book. Thanks for sharing where to find a freebie for it. I love that book! Good choice! Someone else just posted about this and it looks great! I think it will work perfectly for food chains, etc! Very neat that's it's based on a true story. Thanks for the review and freebie of a great new (to me) book. I love the cause and effect that is also evident in the text. I can't wait to purchase this one!!! This book looks perfect for food chains. Thank you for posting the link. There's some great discussion ideas on it. How great for ecosystems! Another to add to the list! I just made a purchase yesterday! Yikes! Amazon loves teachers! P.S. I love the link to the freebie! Really interesting book. Most students have such a connection to animals. I'm sure this book really keeps their attention. I start my life science unit with a game called "Quick Frozen Critters." It is sooo this book! You could use this book and change the animals based on the environment! Total simulation! Here is the link to my post for the activity that would go soooo well with this book!